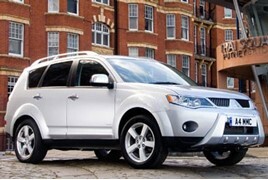 The diesel-powered version of Mitsubishi’s Outlander SUV was the fastest-selling used car on Auto Trader during August – taking an average of just 17 days to leave forecourts. Despite making way for a wholly PHEV line-up in its latest 2019 guise, in response to a shift away from diesel vehicles in the new car market, the 2015 diesel version of the Outlander proved popular among consumers last month. July’s fastest selling used car, the Renault Zoe, may have been knocked off the top spot in August, but the all-electric hatchback still finished the month in second place, with the 2016 automatic taking an average of 19 days to sell. Karolina Edwards-Smajda, Auto Trader’s director of commercial products, said: “To once again be amongst the top three fastest selling used cars in the UK is a huge achievement for the Renault Zoe, and an important bellwether of the improving consumer attitude towards alternatively-fuelled vehicles (AFVs). 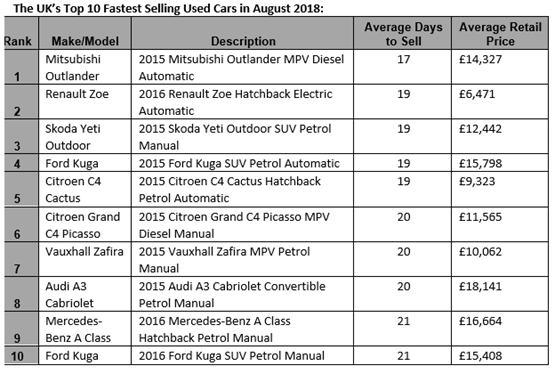 Auto Trader found that MPVs and SUVs dominated both the national top 10 list during August, and the regional trackers during August, concluding that many buyers were chasing large scale, flexible vehicles during the month. Despite the Zoe’s strong showing once again, six SUVs/MPVs made the national top 10, topping six of the 13 countries and regions tracked, including: the South West (2015 Ford Kuga diesel manual – 33 days), Wales (2017 Nissan Qashqai diesel manual– 29 days), South England (2015 Hyundai ix35 diesel manual – 17 days), Northern Ireland (2015 Nissan Qashqai Hatchback diesel manual– 31 days), London (2015 Vauxhall Mokka petrol automatic– 11 days), North East (2015 Nissan Juke diesel manual– 21 days).